There are 41 different learning and reading skills, all of which need to function at natural language speed for efficient reading. Our programs build reading in sequence, from phonological awareness and vocabulary through to reading comprehension and critical thinking. Only a quarter of children are natural readers, born with excellent cognitive skills — processing, focus, sequencing and working memory — required for reading. Our goal is to turn struggling readers into natural readers by improving cognitive and reading specific skills. Reading and listening comprehension require complete automaticity in decoding and in listening. The brain can learn to decode automatically, but this requires complete language dexterity, i.e., sound phonological awareness. Spelling is a critical reading skill. Eventually every word becomes a sight word, mapped through recognition of spelling patterns. Our software methodically improves spelling, first by building a phonetic foundation, spelling rules, and finally spelling exceptions. We help fluency, the ability to decode subconsciously, by building decoding automaticity and with spelling and vocabulary exercises. Inefficient decoding, when the brain is multitasking — decoding and deriving meaning — is exhausting and not enjoyable. 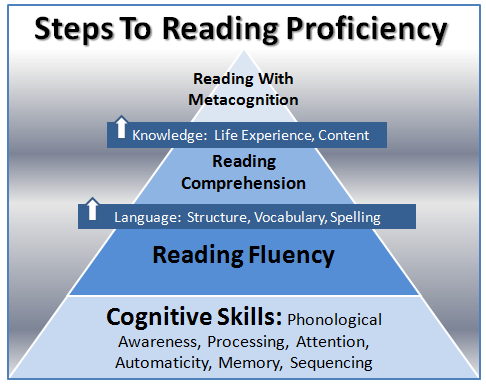 Reading fluency requires a number of different skills — sound phonological awareness, good eye tracking, sight word knowledge, and language structure dexterity. Many struggling readers do not have language mastery because inefficient listening and reading has detracted from their ability to observe how language is structured and used. Weak listening skills can also hamper vocabulary — longer words, or words with difficult to hear blends, tend not to be heard clearly enough to be used confidently. Part of our program to improve reading skills includes exercises that build vocabulary, grammar and syntax. Making sense of the text, understanding the main ideas, and connecting the text to prior knowledge, are all part of reading comprehension. These various elements of comprehension are exercised thoroughly in our reading comprehension software. Good readers use sophisticated, metacognitive strategies. That is, they think critically about their own understanding as they go. Reading with metacognition is the difference between a good and excellent reader, an average or great ACT or SAT score. Sound reading comprehension and good reading stamina require focused attention. Our software has several exercises that build attention skills while reading.